I attend weekly parenting/parenting skills classes at a local nonprofit. Sometimes it's a lot like group discussions and other times it's more of a demonstration. Well, this week we had a nutrition class focusing on dairy. The presenter claimed that plain yogurt is akin to sour cream. I had to test this theory out and, as it turns out, tonight was taco night. I was so nervous because I, personally, don't particularly like yogurt. Actually, I just started eating sour cream a few years ago. Well, tacos and similar dishes have a very distinctive taste and I figured it was the best place to risk this substitution. 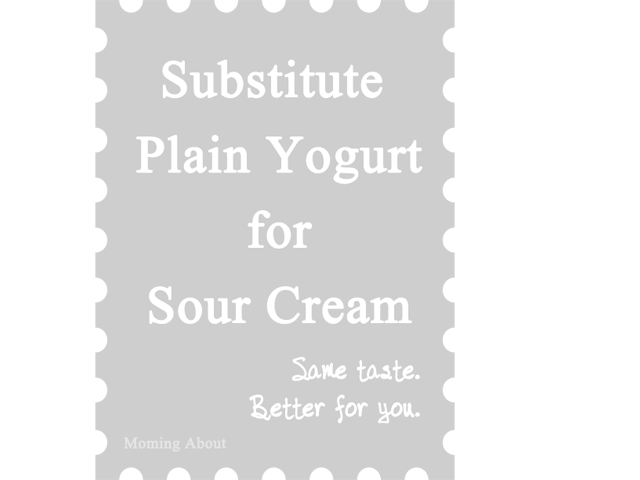 I was absolutely stunned that, plain yogurt does, in fact, taste like sour cream and work as a substitute. OK, that's great and all, but that doesn't mean that you're going to switch, right? Well, switching to fat free plain yogurt is way better for you. This is how the nutritional facts line up. So, go ahead, give it a try! And thanks to Calorie Count for providing me (and anyone else who wanted to look it up) all this information. 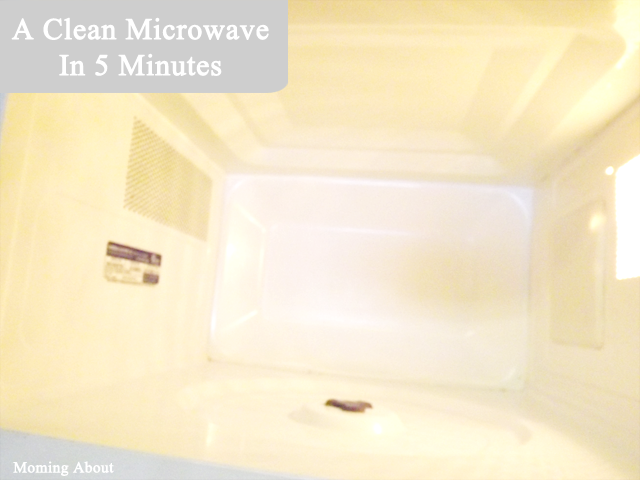 My microwave is not on a counter or even at eye level. Actually, it's high enough up that you can only tell it's dirty if the top is dirty. We have this cool slot above our stove where the microwave sits. Yay. More counter space! However, that means it often gets neglected in the cleaning department. It's pretty easy to ignore something you don't see. Seriously, for some of you, this is something you probably already do. For the rest of you, you'll feel like me when you found this out: duh, why didn't I think of that?! Get a wash cloth and wet it. Ring it most of the way out. 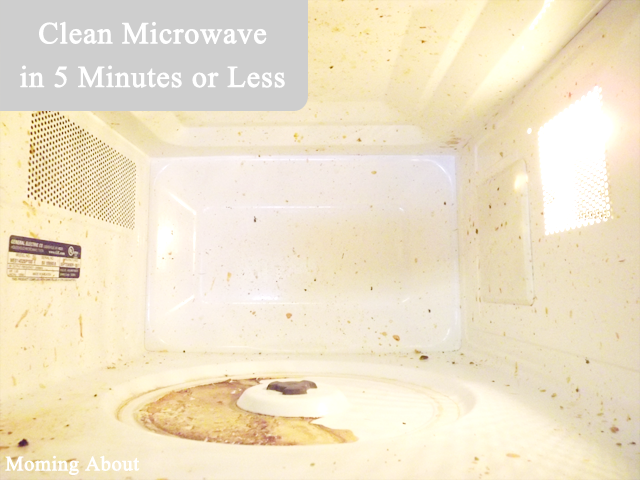 Place damp wash cloth in microwave and turn on for 30 seconds. Let cloth cool enough to be handled. Then, wipe away the yuck. Works like a charm! I learned this at my first job. I worked at a food restaurant and commercial microwaves get lots of use and can get really dirty! 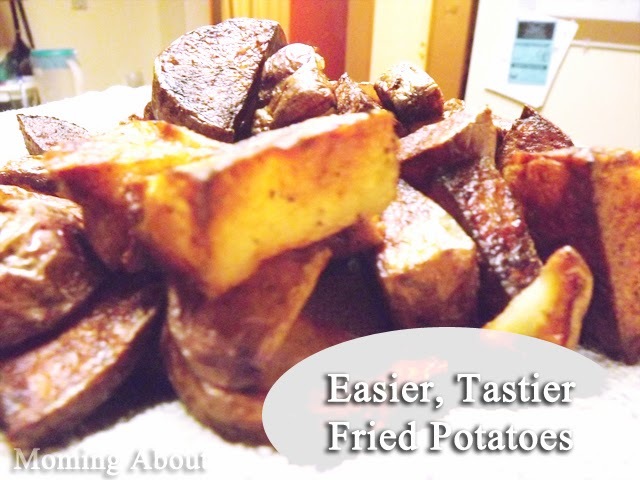 The first time I made these easy fried potatoes, they never even made it onto our plates. We literally ate them all off the serving plate while the rest of dinner was finishing up. They were so good! I have since made fried sweet potatoes this way, too! I have been meaning to post this recipe for a while now, but I needed to track down the original source (Andrea Dekker), who helped me learn how to make the absolutely perfect fried potatoes. She covers this all, more or less, so I can take very little credit. Wash potatoes and allow to dry. Peel, if desired, also. Chop/dice potatoes. DO NOT SLICE. Combine potatoes with salt, pepper, and other desired seasonings in a bowl. In a skillet, heat at least an inch of oil. OIL SHOULD BE HOT BEFORE ADDING POTATOES! While oil is heating, microwave potatoes for 3 minutes. This will help you get the soft on the inside, crunchy on the outside. Pour potatoes in hot oil. Be careful. Cover with lid and cook on med/high heat for several minutes. Stir potatoes infrequently, but don't allow to burn. When all are browned, place them on a plate with towels or paper towels to absorb excess oil. Serve and enjoy! 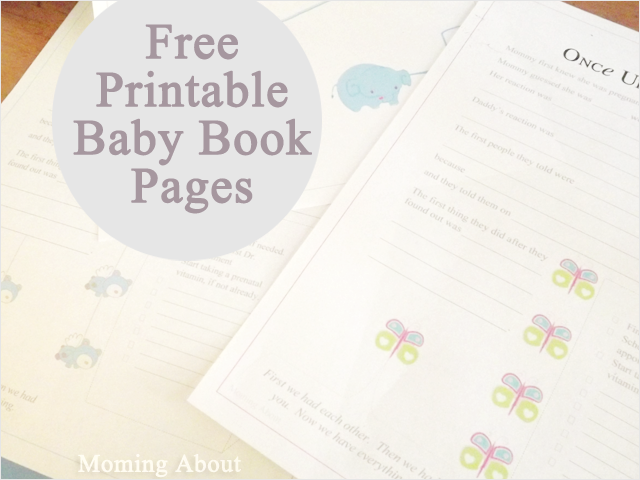 I'm so excited to announce that I created these super cute baby book printables for free! 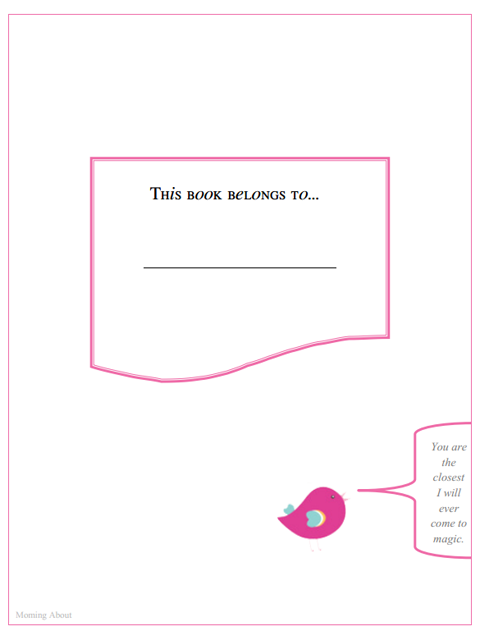 All you have to do is go over to Plucky's Second Thought, where Plucky was kind enough to let me share them! Happy Valentine's Day! I'm not sure when or where I discovered homemade fortune cookies on the internet. It was probably Pinterest. I have been meaning to make them for a while now, and Valentine's Day seemed perfect! I literally made these on Wednesday. What is with all you people making your Valentine's crafts in January? I'm pretty sure my seven year-old will be the only child in class with fortune cookies, let alone homemade ones. Plus, me excluded, everyone at my house loves Chinese restaurants and fortune cookies! 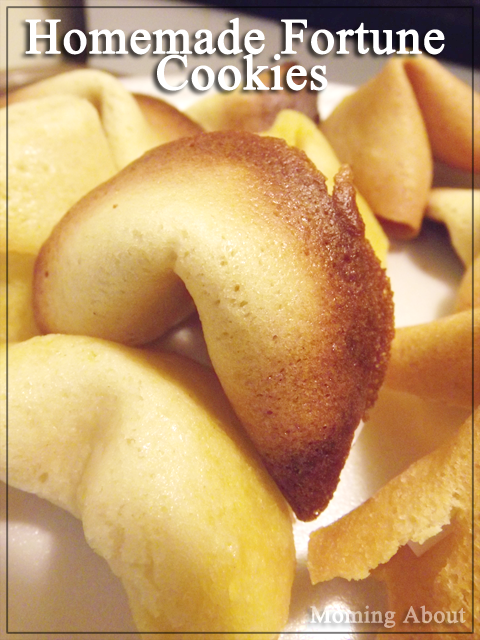 My husband said these were the best tasting fortune cookies ever! What wife doesn't feel totally accomplished and flattered when her husband says something like that? Coat cookie sheet with butter/nonstick spray. Combine vanilla and egg white and stir until frothy. Add in flour, butter, salt, and sugar. Scoop out in teaspoon fulls. May take some practice to find the right size. Only cook 2-3 at a time, until you know for sure you can cook more. Bake for 5 minutes or until 1/4" of the rim is golden brown. 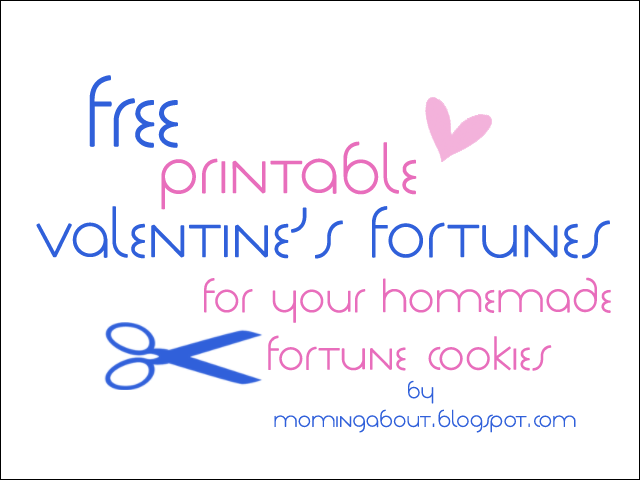 Remove from oven and fold over fortune paper. If needed, drape over the side of a measuring cup to create the pinch. Place inside muffin cups to hold shape until cooled. Click image to go to dropbox download. I mentioned that we had a Minecraft theme for Talon's 7th birthday. Well, for his 6th birthday it was Plants vs Zombies. He was absolutely obsessed with this game, and both of my kids are still quite fascinated by zombies in general. This isn't really a tutorial, per se, but you should be able to use it as a guide or for inspiration for your own Plants vs Zombies pinatas, should you feel the need. 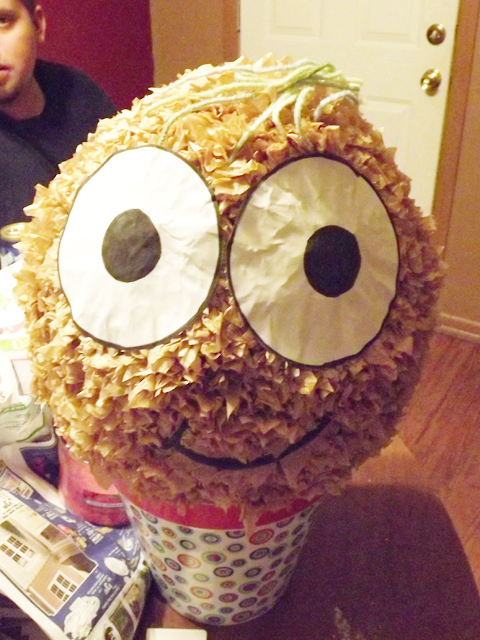 I thought making a pinata was such a good idea. I'm going to come right out and say that it's a lot more work than it sounds like, especially when you're not making just some generic pinata. These were suppose to look like something in specific. 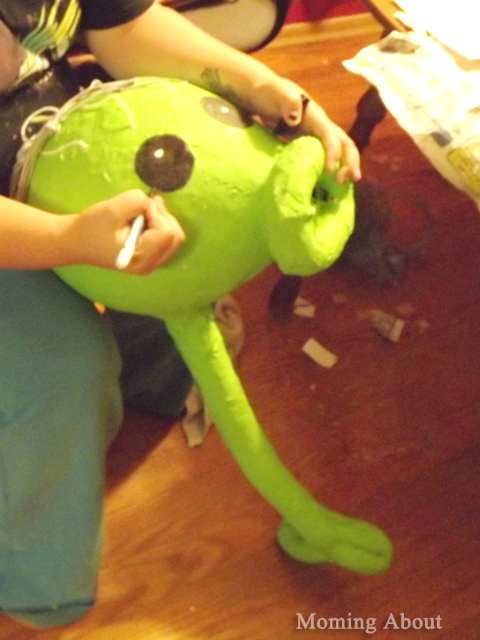 You can see that I used tissue paper on the walnut, but that was so time consuming that we just painted the pea shooter. Anyway, here's what they looked like hanging up via a ton of yarn. I advise using something stronger, for your own peace of mind. Either way, these pinatas were a hit! 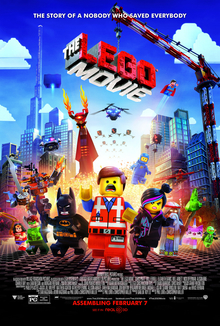 Official Lego Movie poster. Does not belong to me. In case any of you were wondering, I was not endorsed in any way for this post. My kids just really love Lego-themed games and movies, especially when their favorite superheroes make an appearance. I don't think we've been to the movies as a family since Wall-E came out in theaters. It's expensive and kids aren't always the best theater guests, and I'm not a huge movie goer anyway. That's more my husband's thing. I think the movie started just a tad too slow; but maybe that's because I had an anxious 3.5 year-old who decided he loved the movie the minute Batman appeared, and not a second earlier. However, Gabe (3.5 years-old) and Talon (7 years-old), both enjoyed this movie a lot. My husband and I enjoyed it too, making it a great family movie choice. Gabriel was a little antsy, at first, but I think having to sit through a bunch of previews that he didn't care about contributed to that. Otherwise, we made it through 90% of the movie before we took a mini break to refill the popcorn and drink we shared between the four of us. When we got back, Gabe sat on the floor with his head smooshed between two seats in front of us and was glued to the movie screen. We were forced to sit through the credits while my kids named off the color legos in the background images and Gabriel rated the colors a 'yes' or a 'no.' Talon has already decided we need to buy it when it comes out. This movie was a great choice, and I'm so glad that we went to see it. If you were wondering, my favorite character is Firestar (the unicat thing). 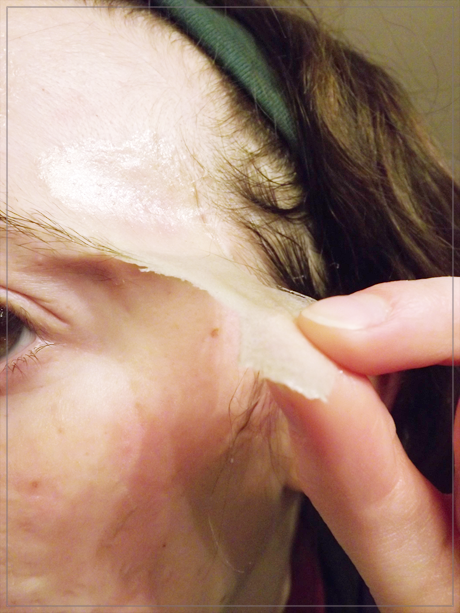 I've actually done this face mask many times in the past, but I had yet to share it. I never had bad skin until my first pregnancy. Of course, I had some acne as a teenager. However, I was mostly blessed with little to none. Anyway, my skin was terrible during my first pregnancy. No glow here, unless you count when my skin was oily. I had break outs galore! Post-pregnancy my skin improved somewhat, but it's never returned to it's prior glory. Well this pregnancy has brought on another onslaught of adult acne and terrible skin, leaving me feeling very self-conscious and generally yucky. 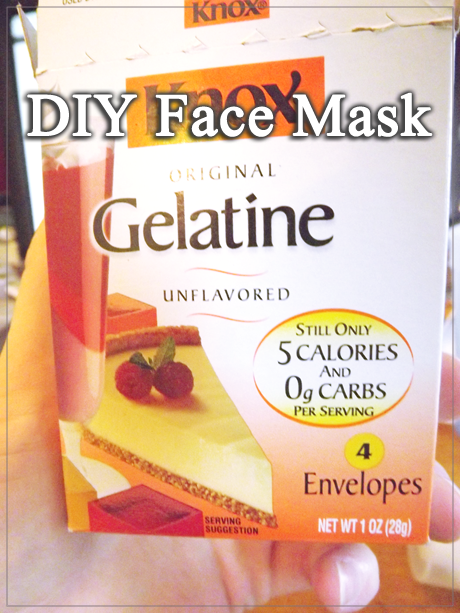 I just happened to remember this little trick and found that I still had to packages of gelatin left! Add ~1 Tbsp water OR milk to gelatin and stir. Milk will help soften skin, but is not necessary. 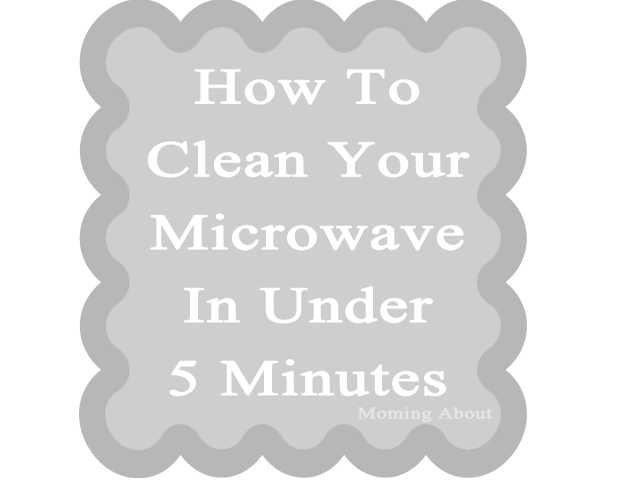 Microwave for 10 to 15 seconds and stir again. Apply mixture to your face with spoon. WARNING: Container and mixture may be hot! Allow 10-15 minutes for the mixture to dry. The thicker the mixture the longer it takes. 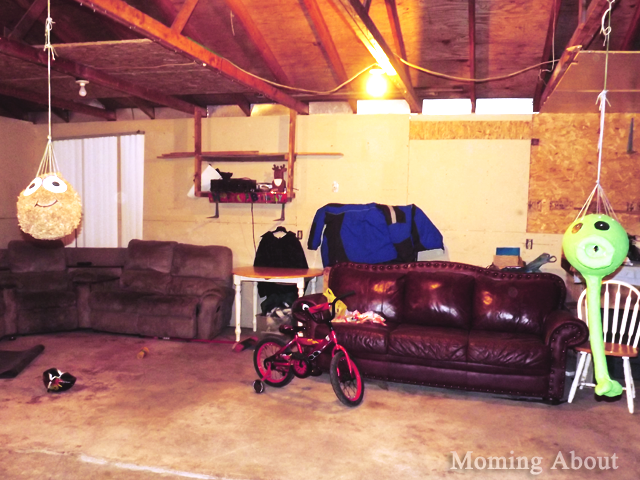 I started to write this post with a bowl full of leftover dip in front of me. Needless to say, the post did not progress until I had completely devoured every last bite! This recipe is just the right amount of creamy and spicy. It's absolutely delicious (even left over). 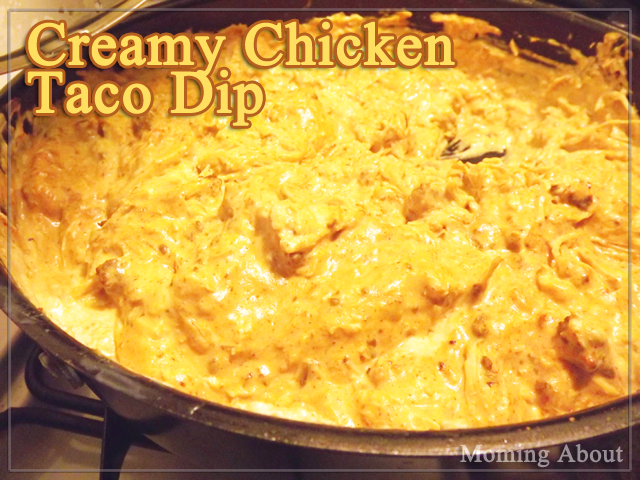 This makes quite a bit of dip, but it could easily be frozen and reheated later. Enjoy! A friend of mine works in HR and sometimes we like to pretend we know what we're talking about and "talk shop". I am very familiar and comfortable with resume creation. 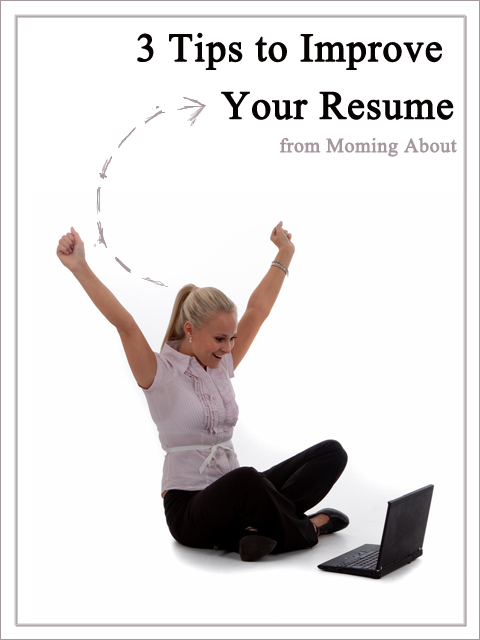 I have utilized many different resume types, styles, or formats. I'm also someone who firmly believes that jobs are not so hard to come by; at least, not as hard as some people would like you to think. My resume is typically updated and I create a new one every 6 months or so; or to highlight my skills differently, depending on the job I'm applying for. Anyway, these are the three things that have stood out most to me from the discussions I've had with her about resumes and from my own experiences job searching. Okay, this seems obvious, right? WRONG! I'll never forget the day, my HR pal said: "I got a great resume today, except they forgot one thing...THEIR NAME!" I'm going to go out on a limb here and say you should get your name and contact info on that resume before anything else; because no one is going to be hiring you if they don't know who you are or how to get a hold of you. Don't use the same old printer paper as everyone else. I always print my resumes on the thicker, heavy duty paper or card stock. My HR pal agrees that if someone turns in a resume that strays from the traditional, flimsy printer paper: it makes an impression. That's a good thing! Trust me. In general, doing something a little extra, a little better, or a little different is going to leave an impression on the person looking at your resume. This one might be a little more controversial among HR reps or anyone who might give you advice on a resume. However, unless your objective is something that really makes you stand out, don't bother including it. My HR pal says she usually skips right past that part of the resume. It might be at the top, but it's not getting first priority. Most HR reps have read the same old objective spiel a million times. Guess who's missed her Friday post deadline? Yep. Me. According to my local library, today is Bring Your Kid to the Library Day. Now, I don't know if it's just my library or maybe it's one of those cool holidays like Make Your Dreams Come True Day, but does it really matter? I don't think so. Going to the library to get me and the boys library cards has been on my imaginary to do list forever. So, when driving past the library yesterday, I decided I might as well stop in and get it done. After all, why not? Even my husband is really keen on our kids loving books, as it wasn't something he was exposed to that much as a kid. I'm a big book lover. I love reading. There are so many ways children can benefit from reading and loving books! 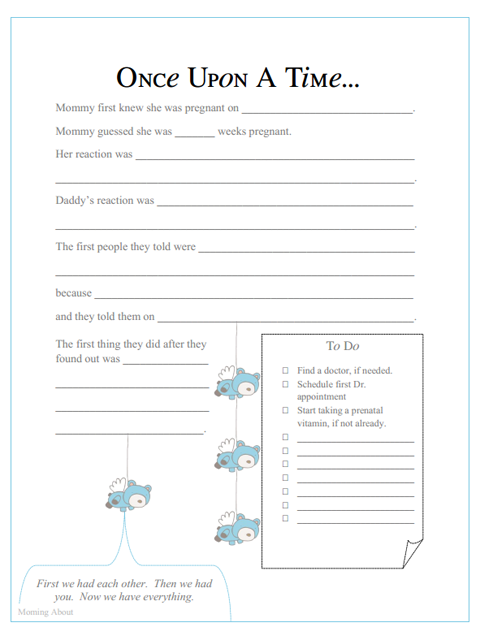 For young children (and people of all ages, actually), it really helps with language development and expanding vocabulary! 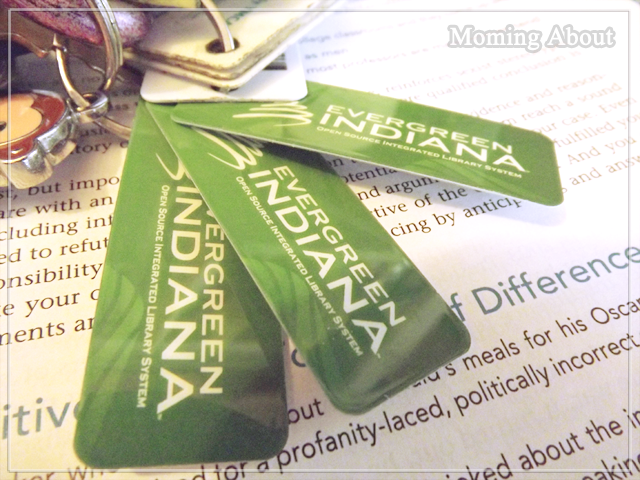 Getting library cards was super simple! It took only a few minutes and Gabe loved playing with the kitchen set, doll house, and train set they had in the children's area. I signed him up for a Book Buddies program and we're starting the 1000 Books Before Kindergarten program. My kids have a decent collection of books at home, and I can't wait to return to the library so they can check out their first books! Their favorite book is Captain Underpants, but Fly Guy is a pretty big hit, too! What books do your kids love? 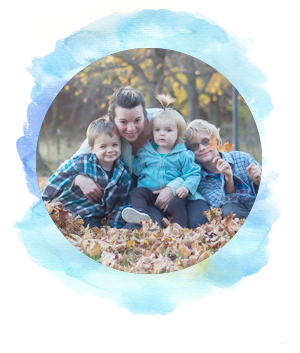 Do you and your kids have library cards? What awesome programs does your local library offer?